Since President Trump’s election, journalists, political scientists and others from across the United States and around the world have visited our little southern Ohio town, population 6,600, to study the natives. Naturally, patronizing local eateries at breakfast or lunchtime is usually part of their itinerary. Some have told me later that, during their interviews, they went out of their way to identify themselves as liberals who have little use for our president. To their credit, they wanted to be honest about who they were and what they were doing. They were sometimes treated with a degree of skepticism, but without fail, they say that people were polite and willing to talk to them — not to mention serve them breakfast or lunch. We contrast this, of course, with the recent episodes involving Homeland Security Secretary Kirstjen Nielsen and White House press secretary Sarah Huckabee Sanders, both of whom were essentially evicted from restaurants — Nielsen heckled away by customers, Sanders asked by the restaurant owner to leave — for the crime of Trump association, similar to a misdemeanor but quickly approaching felony status. Sanders was asked to leave the Red Hen in Lexington, Va. — a town nearly identical in size to Hillsboro, though overwhelmingly consisting of voters with the opposite political persuasion. The Red Hen’s owner, Stephanie Wilkinson, offered a few justifications for her actions: She believed that Sanders worked for an “inhumane and unethical” administration, and her defense of Trump’s “cruelest policies . . . could not stand.” Several restaurant employees were gay and offended that Sanders had defended Trump’s desire to ban transgender people from the military, so they agreed to boot Sanders. Armed with those moral validations, Wilkinson politely asked Sanders and her party to hit the pavement, which they did. But to be nice about it, the restaurant picked up the tab. Let me share some things about Hillsboro, most of which apply to our local restaurants. This isn’t guesswork — my sister and her family own one of the restaurants, and another one across the street hosted live breakfast segments during a visit by “Fox & Friends” in January. Hillsboro voted overwhelmingly for Trump and is also “deeply divided” over certain issues. Some restaurant owners in this adamantly pro-life town believe that liberal Democrats such as President Barack Obama and Hillary Clinton support, as they see it, the “inhumane and unethical” practice of abortion, which cannot stand. Naturally, the precedent set by the Lexington restaurant means that Hillsboro restaurants and others in conservative enclaves are now ethically, if not legally, empowered to kick anyone out — especially a public figure — if they feel compelled to take a stand on principle. Of course, they’d be ridiculed as intolerant rednecks rather than celebrated for their moral fiber, but that’s the different standard we all know and accept. The growing encouragement from many on the left and some in the media to define Trump supporters as pariahs or Nazis — including his staff, according to Ana Navarro, and even his voters, according to Donny Deutsch — seems designed to justify and even encourage harassment, intimidation and — then what? The rising McCarthyism of the left will soon lead to the money question: Are you now, or have you ever been, a member of the Trump coalition? 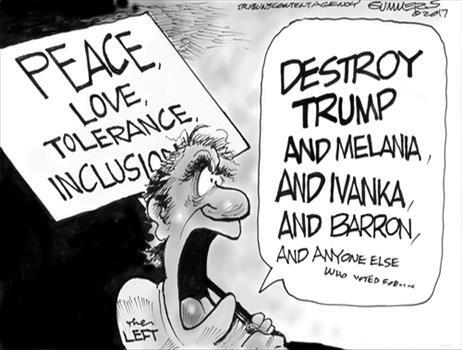 Intolerant, angry, increasingly confrontational — it is astounding to watch them become that which they claim to despise about the president.